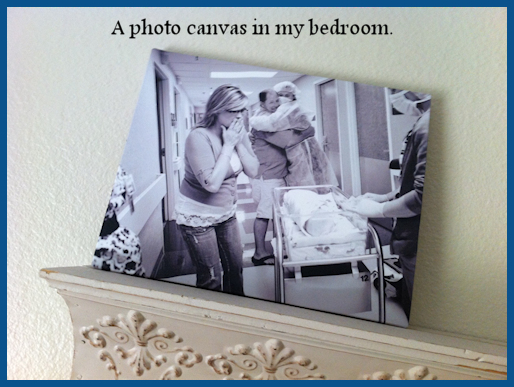 I’m kind of mad for the new “transfer photos to canvas” trend. 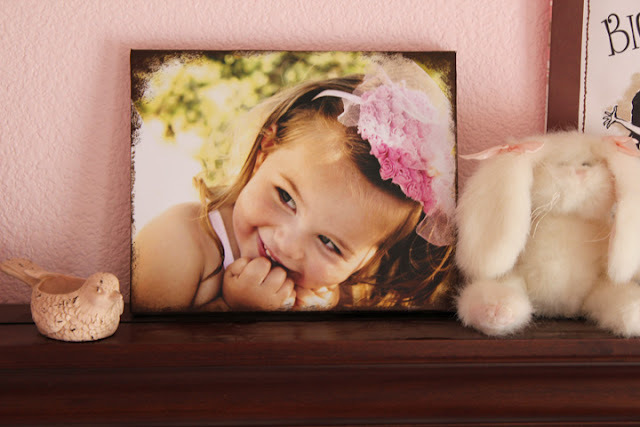 In my bedroom sits a very special photo that was transferred to canvas as a gift to me from my daughter. It’s one of my most prized possessions because the photo was taken at the exact moment I first saw my first grandchild – Brady. Picture on canvas of MeeMaw Monkey seeing Brady for the 1st time. 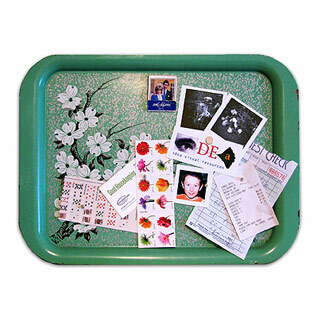 But, if you’re Crafty Suzanne of the Long Island Crafties, you can transfer a picture to a canvas all by your lonesome. 1. 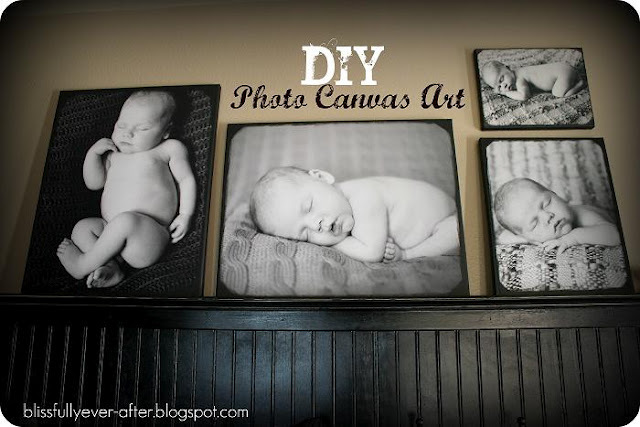 Blissfully Ever After had professional photographs taken of her sweet baby and created her own lovely DIY canvas photo collage to show them off. It’s absolutely beautiful, isn’t it? 2. 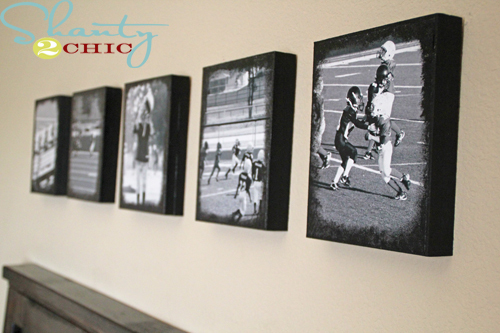 Shanty 2 Chic made transferred pictures of her son playing football onto wood and the result is pretty awesome. Wish I’d known about this when my son was playing! 3. 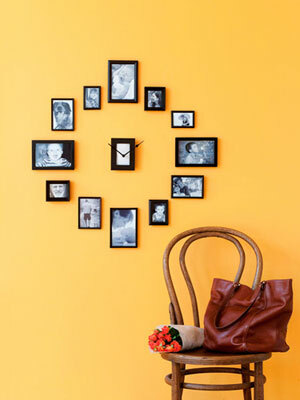 You can transfer more than just photographs to canvas. 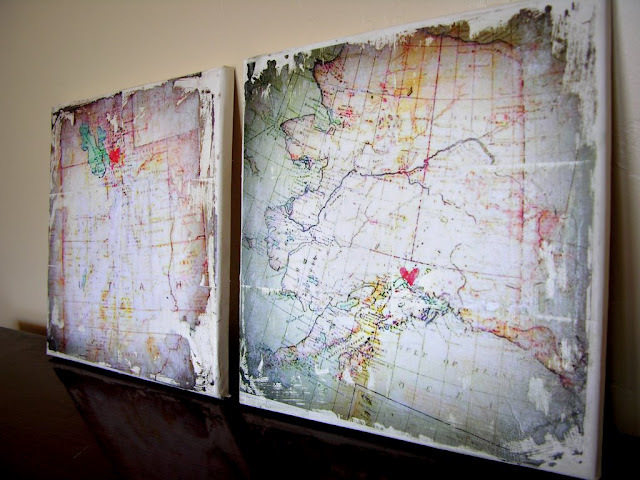 Corner House transferred images of state maps of Alaska to canvas for some pretty awesome wall decor. What a cool idea! 5. Christine & Co. did an image transfer to canvas that I think is just glorious. I’m in love with it. 6. 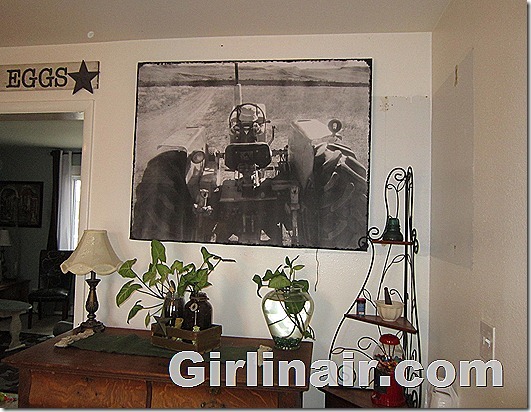 Girl in the Air created this GIANT 4′ x 3′ canvas of her son on a tractor for her kitchen. Isn’t it cool? She says using spray Mod Podge is the best way to go. Awesome, awesome, awesome! 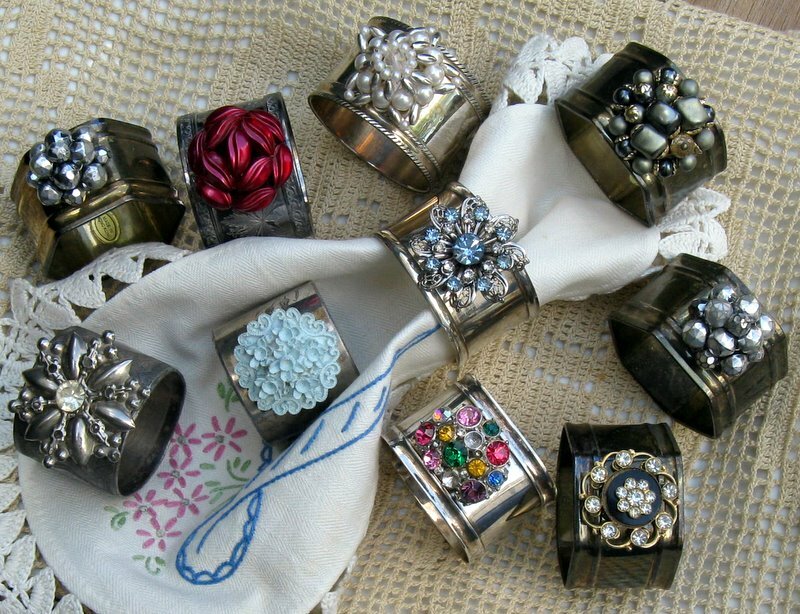 Do you ever wake up in the morning and think, “I just really want to write about napkin rings today?” Is it weird that I did? I caught napkin ring fever when last I was in Pier One. 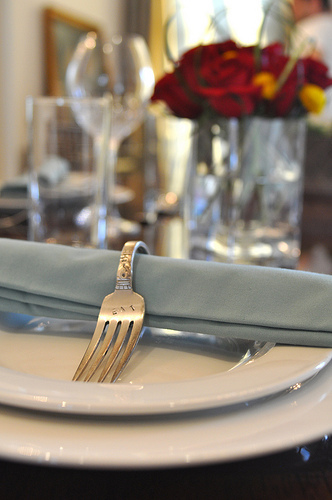 Their napkin rings look like jewelry and I wanted all of them for my very own. Today I started thinking… I’ll bet there are crafty bloggers out there who have taken the idea of napkin rings to a whole “nuther” level. Sure enough, there are always brilliant minds who can create something beautiful out of thin air, and napkin rings are no different. I have so much respect for these crafty ladies. A Brooklyn Limestone in Progress is just a wealth of creative energy & talent. 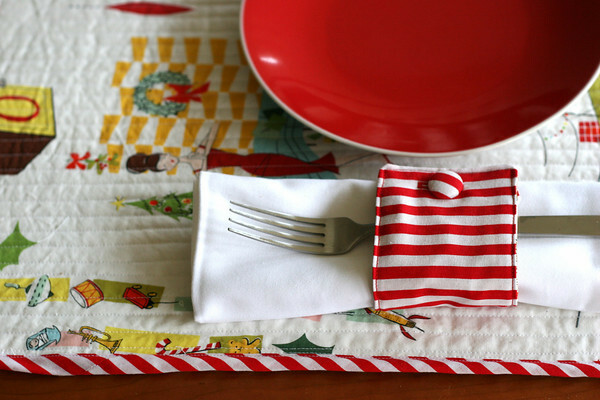 She took old forks and turned them into gorgeous hand-stamped napkin rings. Maybe I should start a blog about what to do with old husbands as I do have a growing collection of those just lying around. 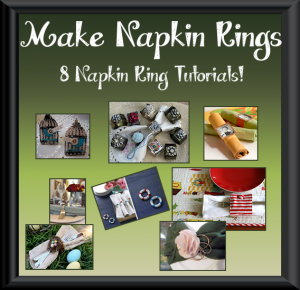 Shower curtain rings become napkin rings! Seriously!? 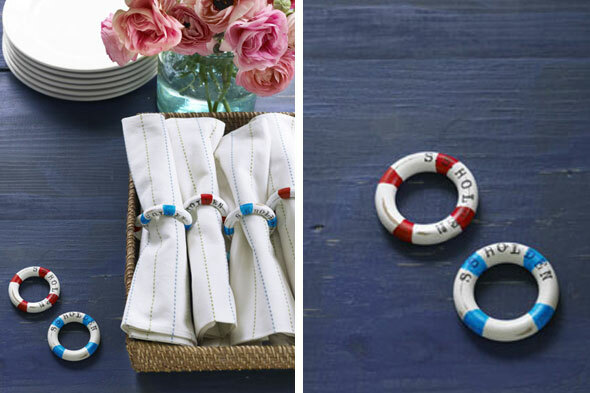 Via DIY Life comes these shower curtain rings that have been turned into nautical themed napkin rings (found on Country Life) that are crazy cute. 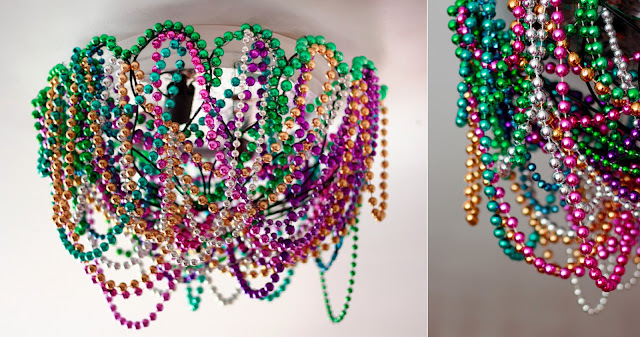 Even if I were captured by terrorists who demanded I come up with a craft involving old shower curtain rings, I couldn’t have come up with this. Meanwhile, I’m assuming terrorists like that probably work for Martha Stewart. There are a lot of things I can’t do. In the top three are: I can’t sing, I can’t multiply by 9, and I can’t sew. 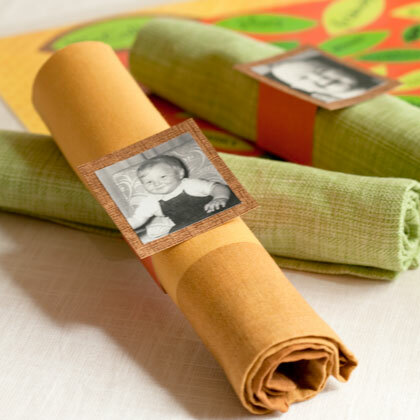 The minds behind Prudent Baby CAN sew however, and they came up with these cuter-than-cute reversible napkin rings. And if they weren’t cool enough for you, (you napkin ring snob), they are reversible! Brilliant, right? 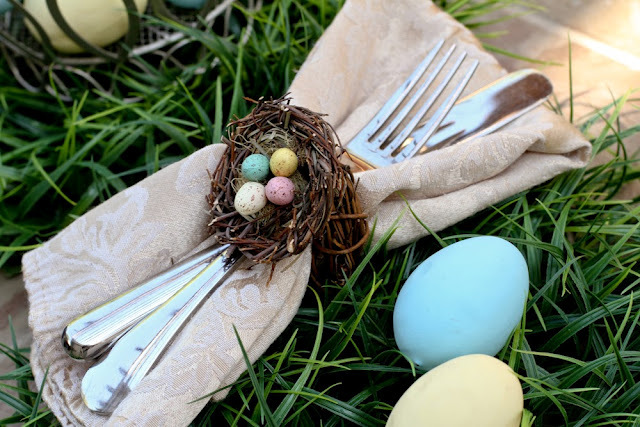 If you’re trying to put a little “spring” in your house, check out these little bird’s nest napkin rings you can make. From Scissors & Spatulas, these sweet little nests would really brighten up a table. Best part? No danger of real birds popping out while you’re enjoying some meatloaf. 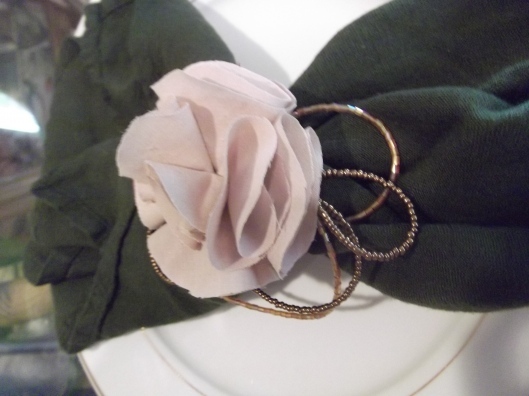 Crafty California Cottage whipped up these rosette napkin rings and I think they’re just about perfect. She says they’re easy to make. That’s only because she hasn’t met me. She means they are easy to make for “normal” women. 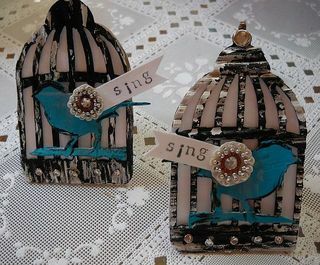 Mel Designs made these outrageously precious bird cage napkin rings from recycled materials. Just wow. Aren’t they pretty? Feels Like Home saw a craft in a 2009 copy of Family Fun Magazine using photos for DIY napkin rings, and made her own. 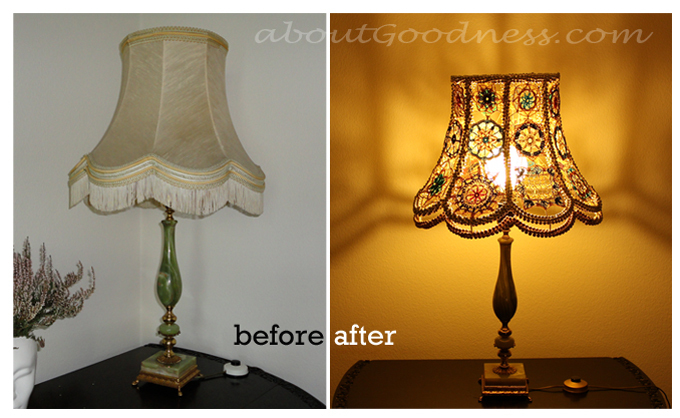 I love the idea, and I can think of lots of ways you could change this up a little. The Lorax is such a cute movie. 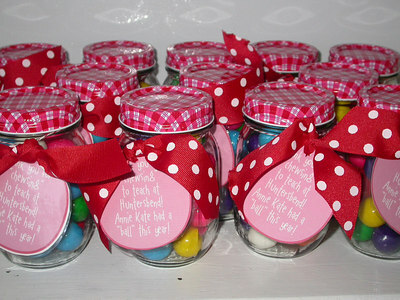 I adore the bright colors for a kid’s birthday party! 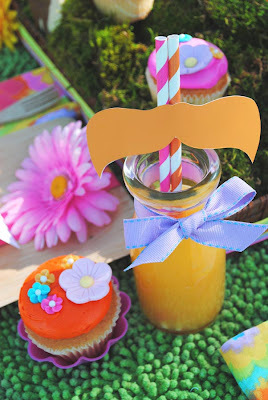 Check out all these completely adorable Lorax Theme Party Ideas. “Unless someone like you cares a whole awful lot, nothing is going to get better. It’s not.” The Lorax, Dr. Seuss. 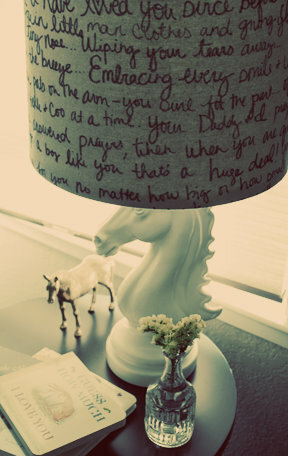 Can you imagine being married to Dr. Seuss? I wonder if he rhymed every time he was supposed to take the trash out? But I digress. 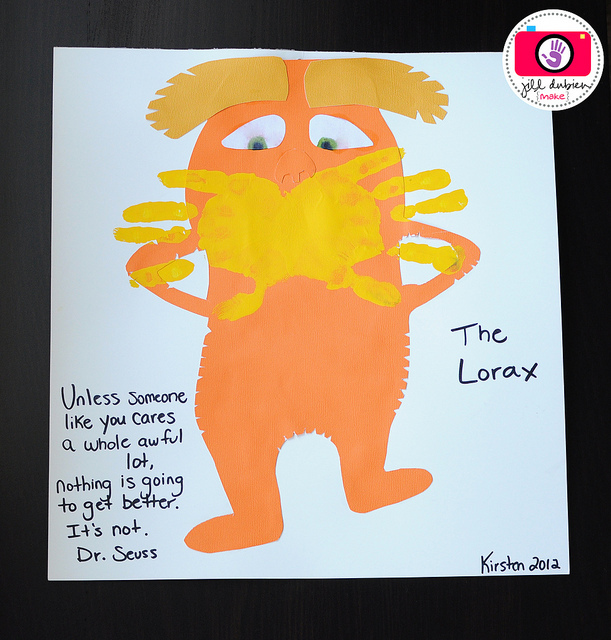 Let’s take a look at some of the coolest, most colorful ideas I’ve found to throw the biggest and best Dr. Seuss Lorax kids party EVER! 2. 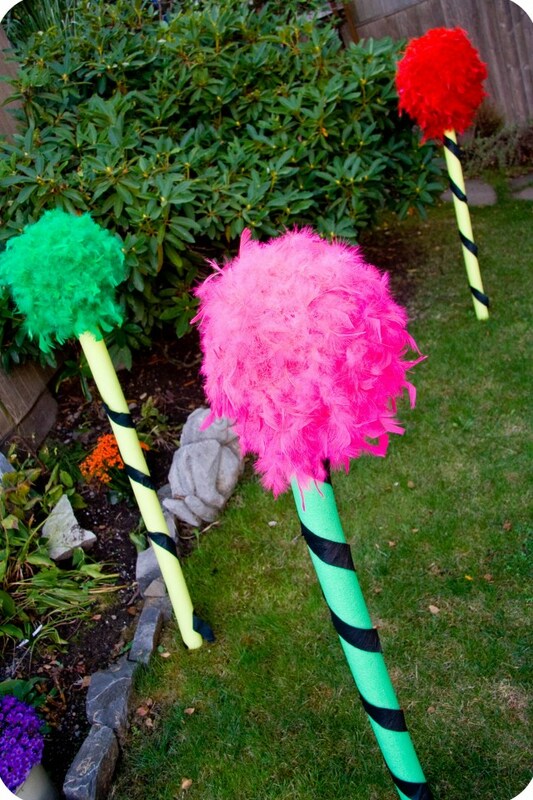 You absolutely cannot have a Lorax birthday party for your kidlet without these Lorax Truffula Trees. I forbid it! (I’m sorry. Twenty-seven years of Mothering just popped out for a minute.) 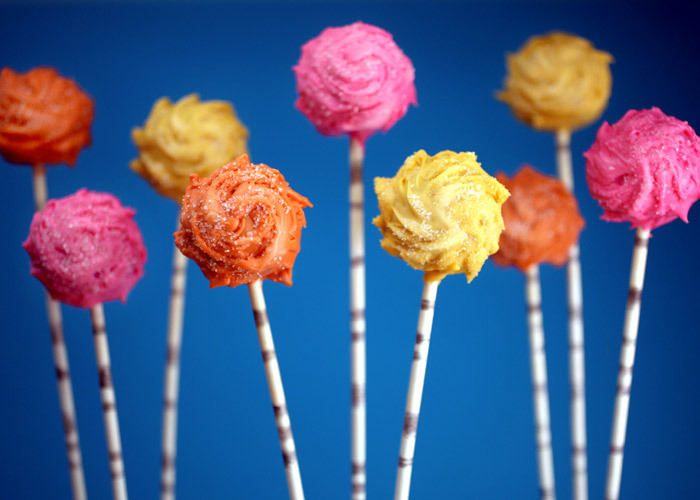 All you need is cake mix, pretzels, cotton candy, and this tutorial from Tablespoon contributor – Pizzazzerie. 3. 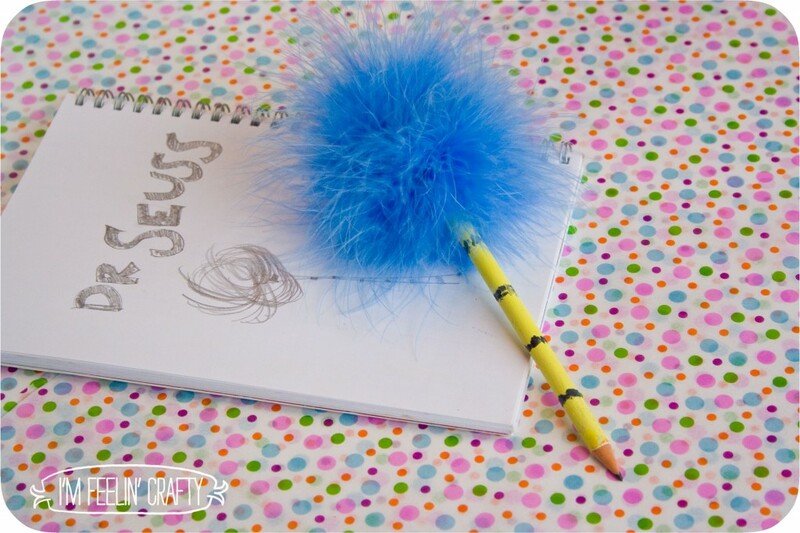 Truffula Tree party favors hardly get much cuter than these Truffula tree pencils on the I’m Feelin’ Crafty blog. (I’m feelin’ sort of icky today, as it happens.) 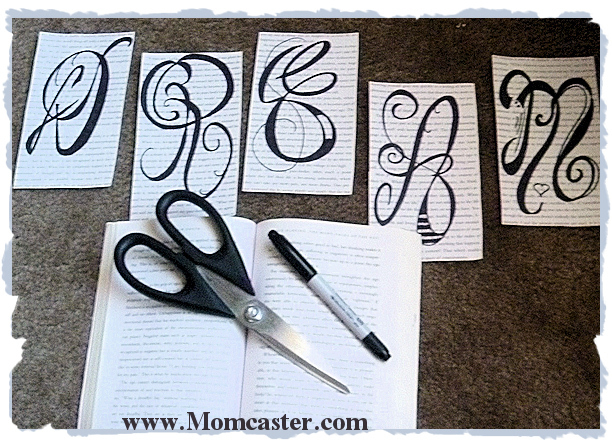 Visit the blog for the how-does-she-do-this tutorial! 4. If you aren’t familiar with Bakerella, I don’t know what to say right now. She is the absolute Queen of the cake pops, or as I like to say, she’s the Elvis of cake pops. I will know I’ve made it in life when Bakerella makes a Momcaster cake pop. 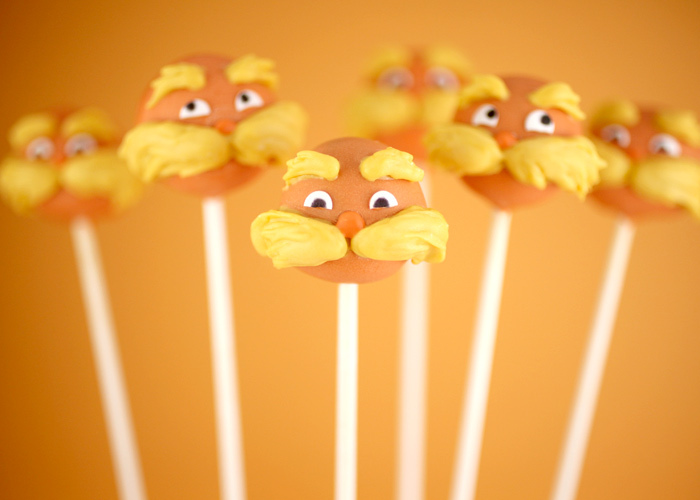 Until then, can you even stand how adorable these Lorax and Truffula Tree cake pops are? 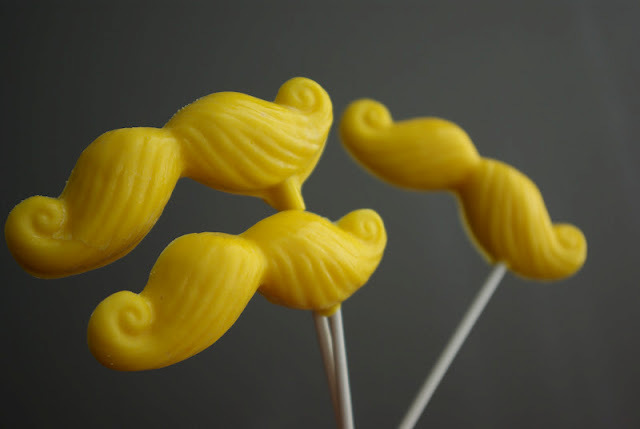 If you’re ready to make them for your little Lorax party, the always generous and genius Bakerella offers a tutorial. 6. Meet The Dubiens had a little help from some small hands to make this Lorax print. 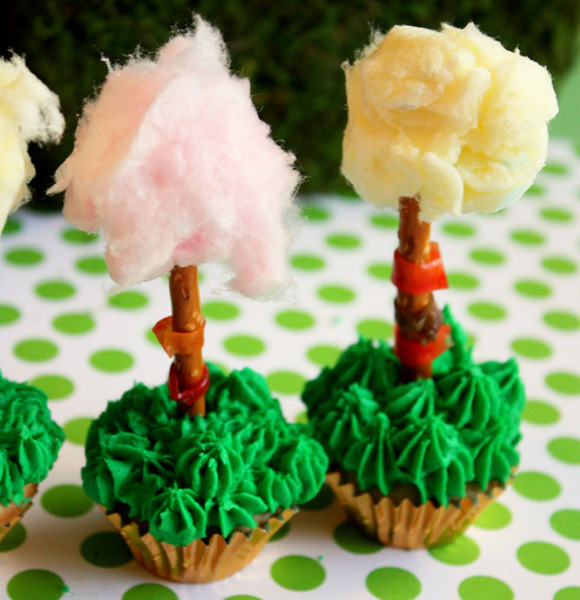 Kidlets would LOVE to make this at a Lorax birthday party, I think. Isn’t it a cutie-patootie idea? 7. 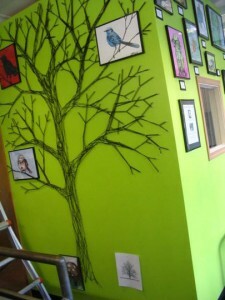 Also from I’m Feelin’ Crafty, look at these giant Truffula Trees! Seriously. This is one smart chick. She made these from those noodles you use in the swimming pool! I swear to you, if ever I wake up and start thinking of ridiculously awesome things to do with swimming pool noodles, you know I’ve had a stroke and should be seen by a trained physician at once. LOVE THIS! 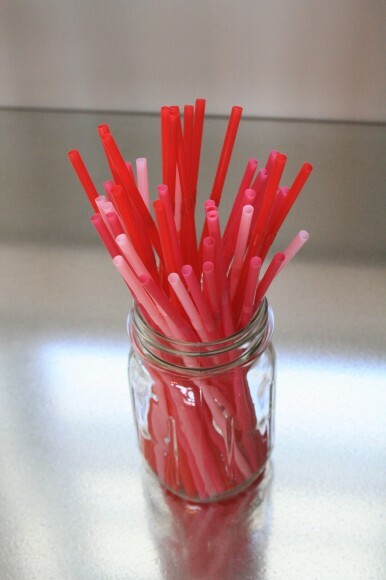 I am drinking the Mason Jar Kool-aid! I swear to you I had a dream last night that I was being chased by Martha Stewart who wanted to share her Mason Jar ideas with me…and also stab me in the kidney with a hand-crafted shank she’d made from crisp autumn leaves and re-purposed light bulbs. In other news, Martha Stewart scares me a little. I can’t help loving Mason Jars and every time I find some person online (obviously smarter & more creative than me), I am delighted by the ideas they come up with for using these jars. 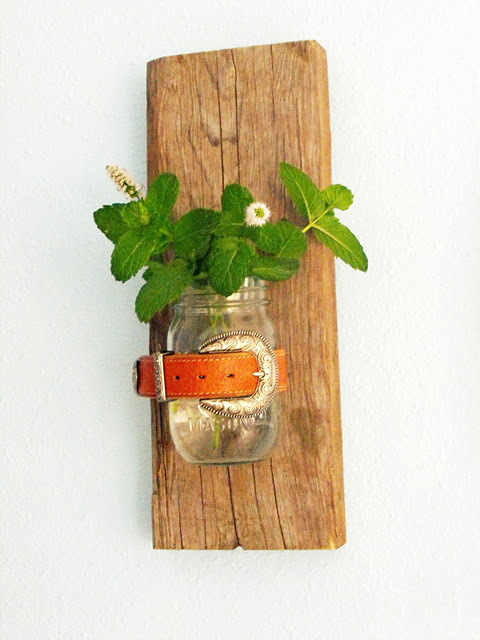 Once you’ve checked out these 10 Mason Jar ideas, you’ll want to see 5 Easy Mason Jar Crafts for even more Mason Jar awesomeness, and… and… AND… visit my newest website baby www.MasonJarCraftsBlog.com. You’ll dig it. I know this. 1. 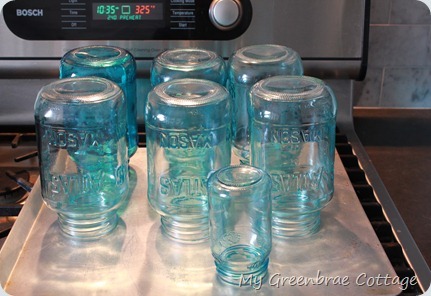 My Greenbrae Cottage has a fantastic tutorial for painting Mason Jars in order to make them look like they are vintage blue. Aren’t they absolutely delicious? 2. 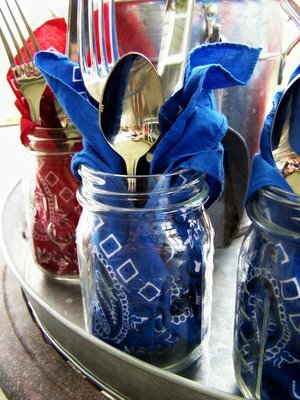 This idea to turn a plain Mason Jar into a super cute way to hold utensils for a party is from A Soft Place. My mind wanders to all the possibilities! 3. 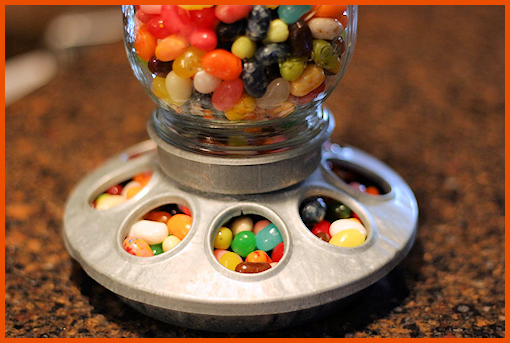 These gumball filled Mason Jar gifts are just beautiful pops of color. 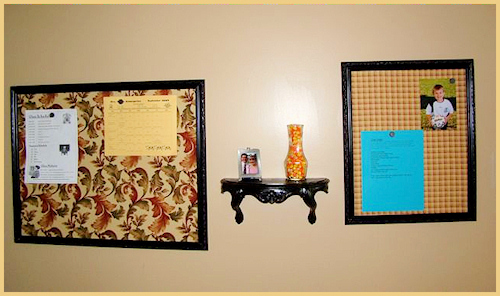 The 2 Clever Blog says she gives them each year to teachers, bus drivers, crossing guards, etc. Her blog is named appropriately because she’s definitely 2 clever! 4. The Pleated Poppysays she hearts Mason Jars and I’m inclined to believe her. She shows off lots of the crazy cute ways she uses Mason Jars…which makes me feel like a zombie sucked my brain because I didn’t think of 85% of them myself. 5. As a Hillbilly American myself, I am completely offended at these Redneck Wine Glasses aka Hillbilly Crystal made from Mason Jars. Okay. I’m not really offended. 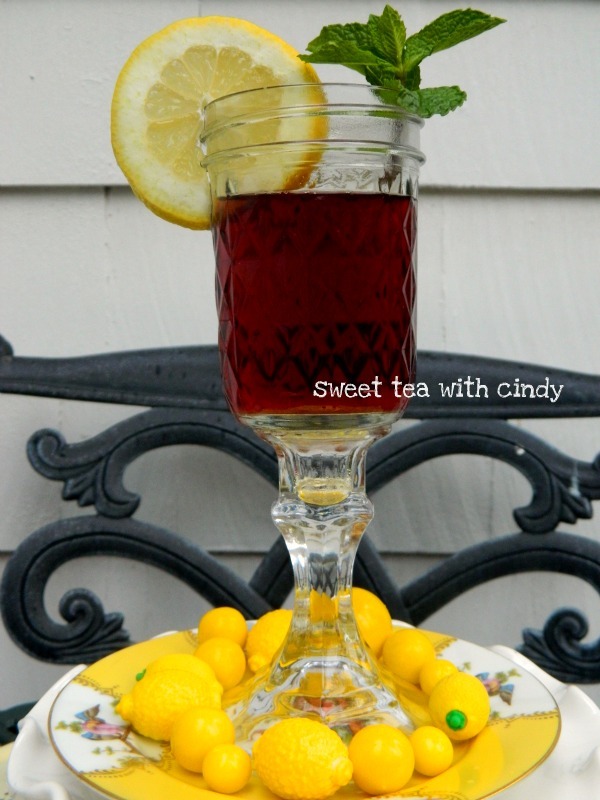 Any website called Sweet Tea with Cindy is too Southern for me not to love. 6. 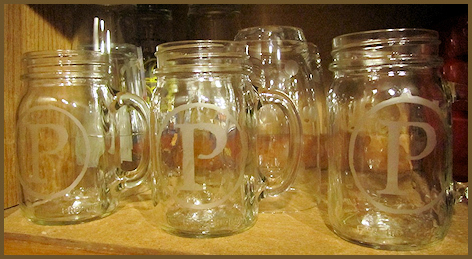 I don’t care who you are, etching Mason Jars seems like the right thing to do. 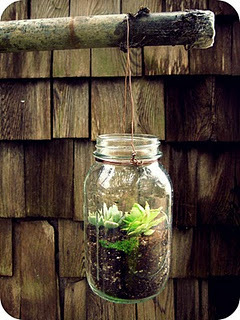 This tutorial on Sense & (Non) Sensibilityis very well done and I think what she’s done amounts to Mason Jar loveliness. 7. These Mason Jar terrariums from Rae’s Little Garden make me want to give it all up and go into the Mason Jar farming game. I don’t think I could grow regular corn in them, but maybe those tiny little corns that are on salad bars that I never eat because I don’t understand what the hell they really are. 9. 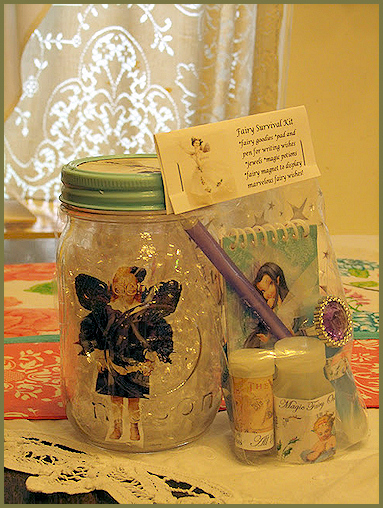 Pollyanna Reinvents captured a fairy in her jar. This delights me. I’m going to open a jar and put it outside on my balcony right now. But first, I’ll run to the Walmart for some Fairy Chow. I think Purina makes it. 10. I found this incredibly adorable Easter Mason Jar centerpiece craft at The CSI Project. It’s by Larissa at Just Another Day in Paradise. 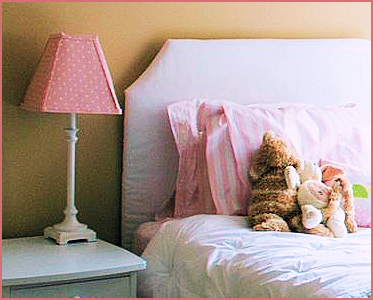 I’ve personally always found the notion of a giant bunny with a basket full of boiled eggs and chocolate creeping around my kids while they slept a little objectionable. 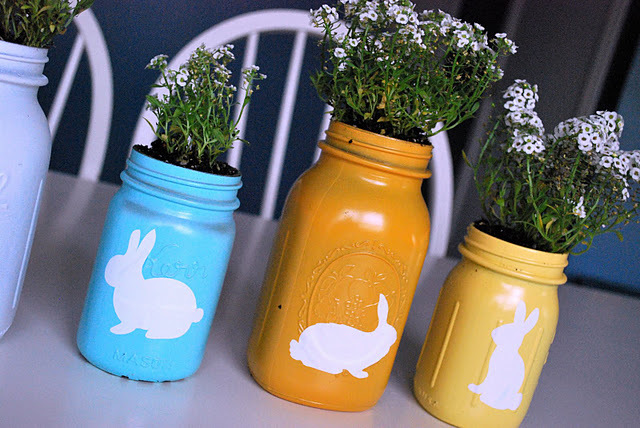 I’m loving these bunny adorned Mason Jars, though. Truly. 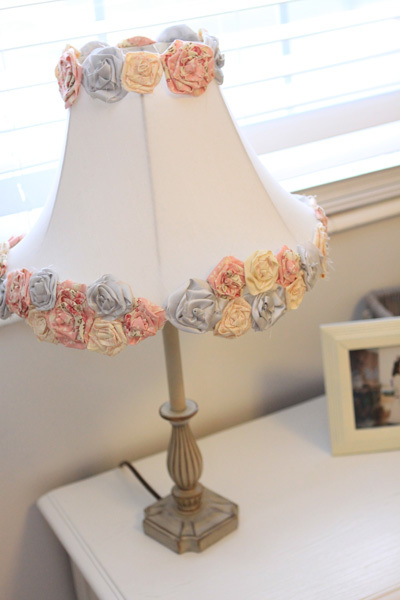 I’ve seen lots of crafts online where people use covers from old books and create some really cool crafts with them. 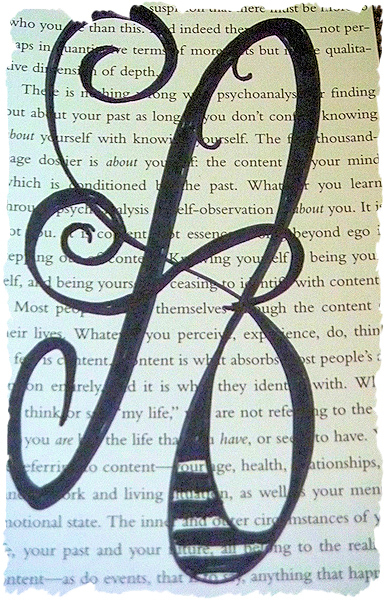 Today I wanted to see what I could do with just pages from a book, a Sharpie and my love of doodling. 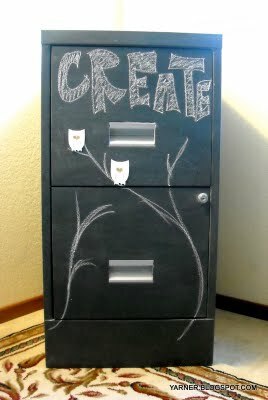 I’m kind of excited about this fun little craft because it was so easy and I was able to complete it so quickly. My “old book craft” took less than an hour. 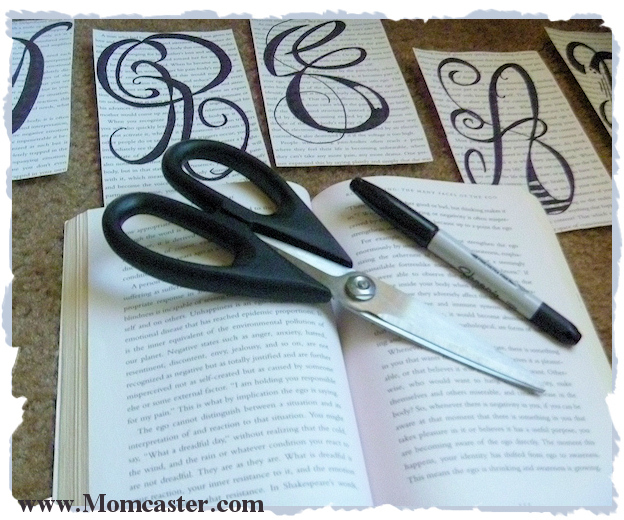 All I did was tear pages from a book, doodle the letter I wanted on the page, grab a pair of scissors and cut off the white borders so that the page was filled with text. After I finished, I did smear a little Elmer’s glue and then sprinkle a bit of glitter on them (because I love sparkly things), but you don’t have to. They look really nice just having the black letter on the page. 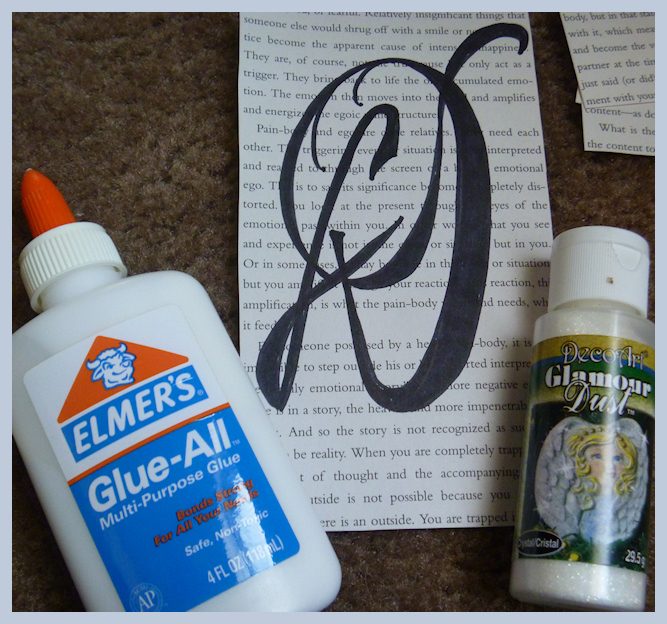 I think I’ll do this book craft again, but next time I’ll probably cut the page to fit a frame size. 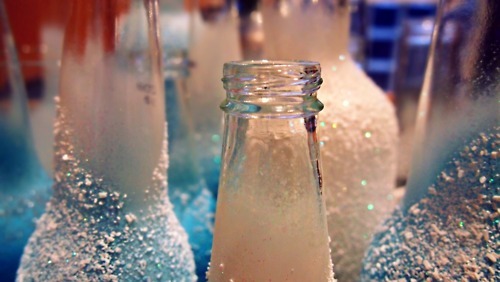 Have you done this kind of craft before? Are you going to? I’d love to see what you come up with. The letters don’t need to be perfect, so have fun. I think it produces a prettier result when it’s obviously hand-drawn. 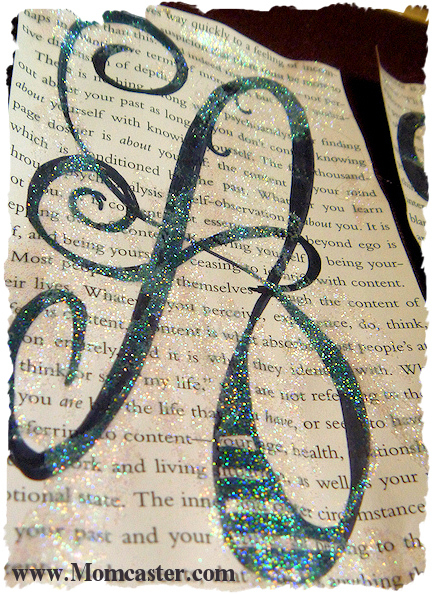 I just kind of smeared a little bit of Elmer’s glue around in no particular pattern, and sprinkled some super fine glitter on it and shook off the excess. What do you think? 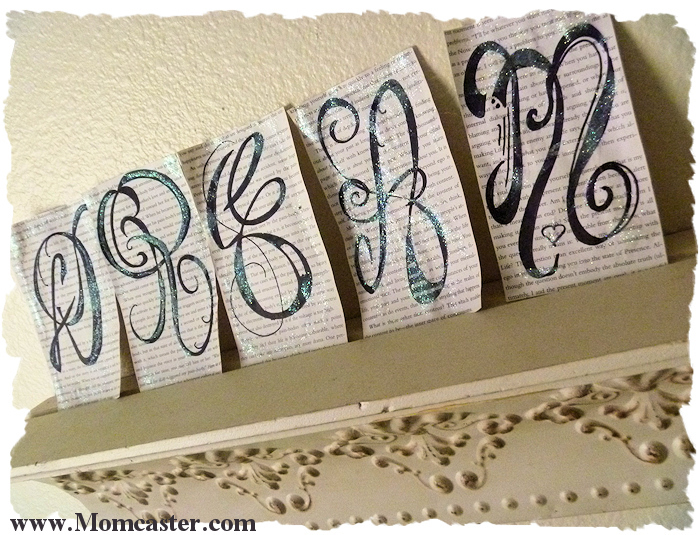 Do you have some crafts made from old books? I’d love to see! Things that glow make me happy. 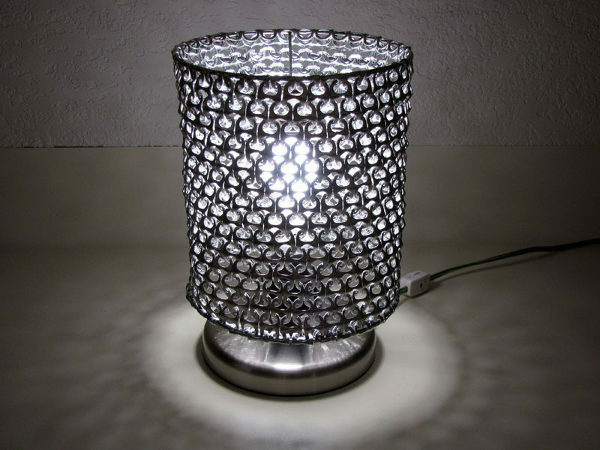 Lately I am completely drawn to things that glow in the dark ideas and crafty projects. No idea why! Every time I see things that glows in the dark, I have to check it out. The talented crafty brains below have some up with some awesome things to do with glow in the dark paint, and one even tells you how to make FOOD GLOW! 1. 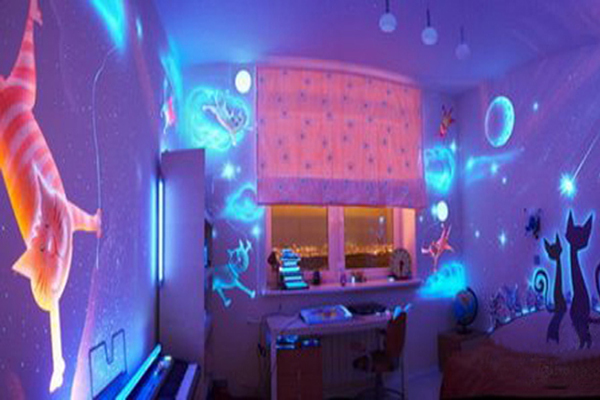 From Family Fun, take a look at this super fun glow in the dark mural for a kid’s room. 2. 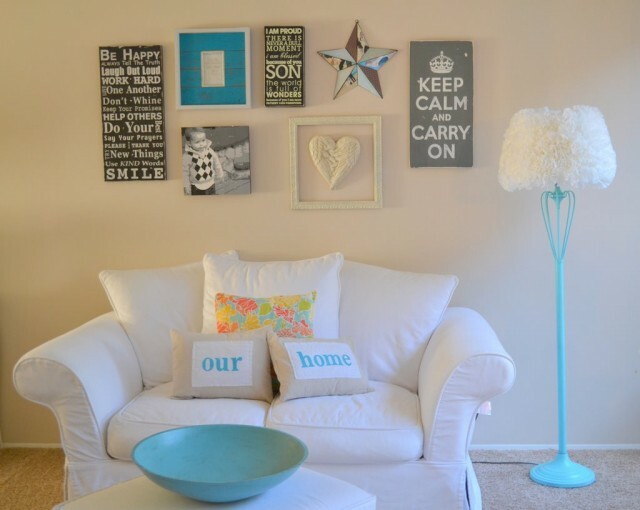 This glow in the dark little girl’s room from The Paint Princess is super fun. 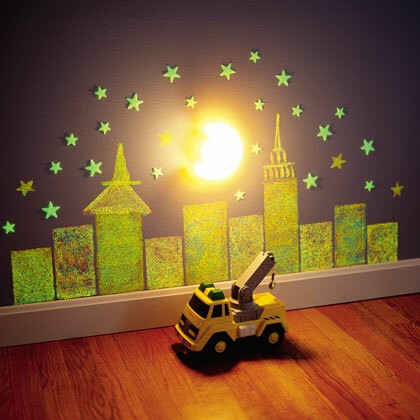 You know, this glow in the dark paint could really help a little one who is afraid of the dark! 3. 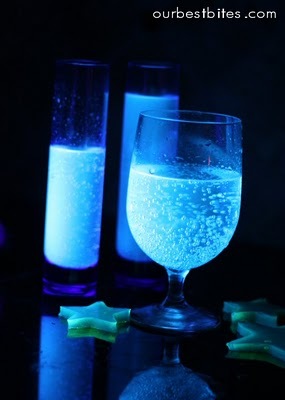 I had no idea a person could make glow in the dark food and drinks at home. Guess what? You totally can and when you find out the super simple, non-toxic trick to doing it, you’re going to be like, “What?” Nice tutorial at Our Best Bites. 4. 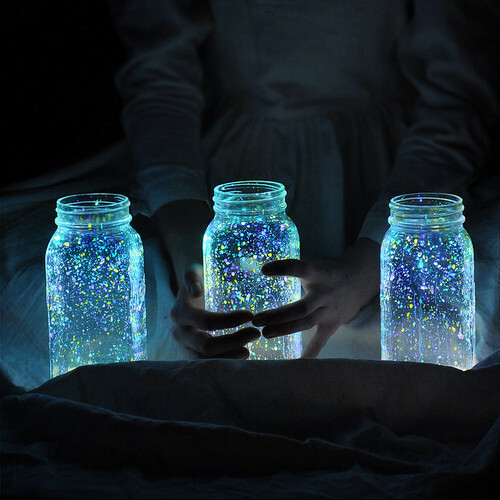 These glowing firefly jars are so cool. 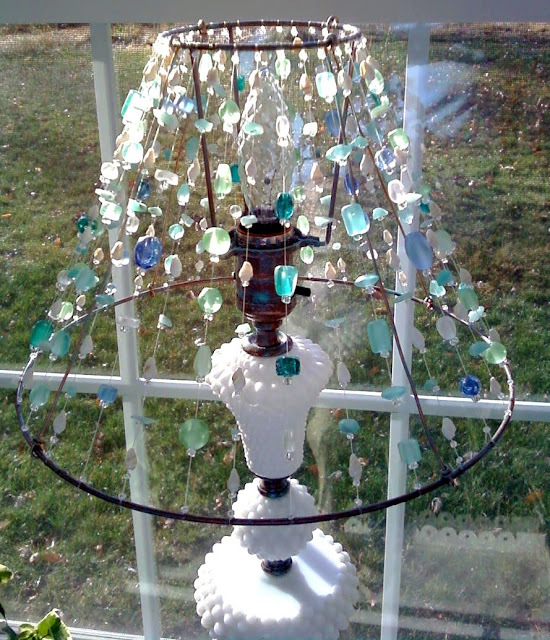 I have another one listed on this site made from a mason jar that’s also pretty awesome. I like the colors of this one featured on Curbly very much. What about you? Do you love things that glow? 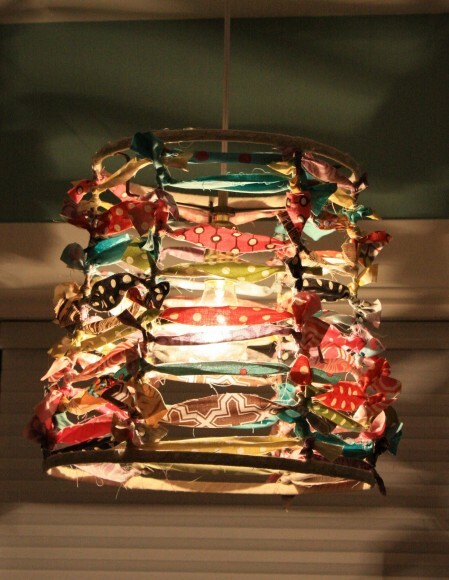 You might also like this post about Mason Jar crafts. They are equally as awesome. Some people really don’t care for Valentine’s Day. I kind of love it. 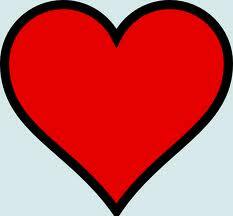 I think any day that you are encouraged to tell people, “I love you,” has to be a good thing. Another reason I love Valentine’s Day is because you don’t have to feel like you need to buy a gift. 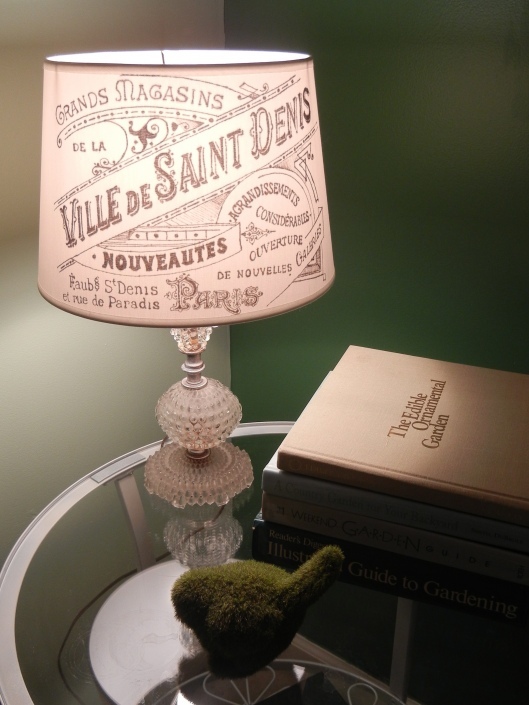 There are so many absolutely wonderful “do it yourself” gifts you can make for someone you adore, you’ll have no need to run out shopping. 1. I’m seeing these cool rings made from quarters all over the internet. 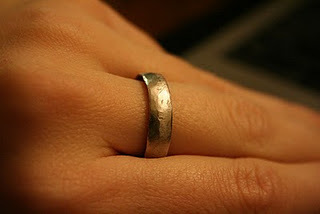 A Law Student’s Journey has the instructions for making a great ring from a quarter. Love it! 2. 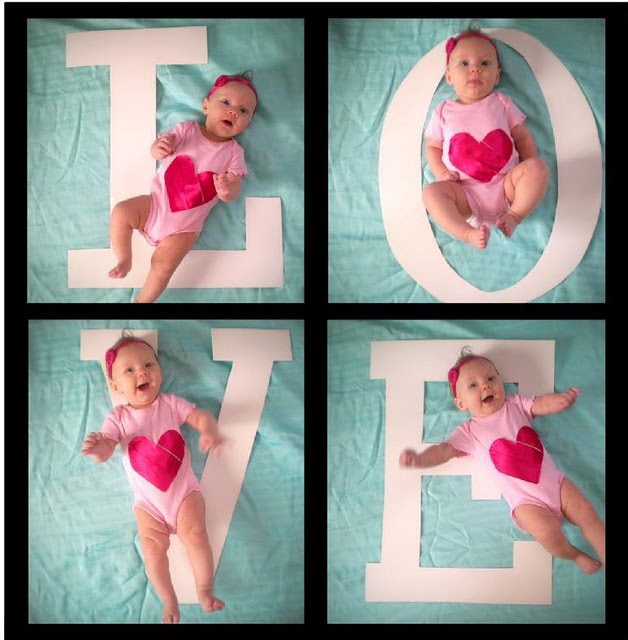 What Dad, Grandparent, Aunt or Uncle wouldn’t just melt upon getting this adorable DIY Valentine photo? The Letter 4 has some precious ideas for snapping photos for February 14th. 3. Valentine’s candy is just okay. Anyone can buy a box of heart shaped candy that tastes like it has toothpaste in the middle. 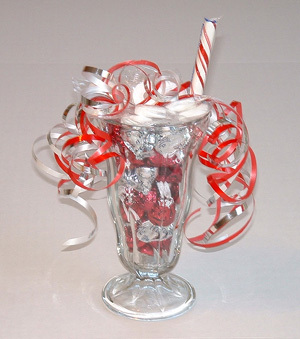 But this idea to make a candy sundae from Edible Crafts Online is so cute, I can hardly stand it. If it’s the thought that counts, you’ll score! 4. I always say my kids are funny because I ate Pop Rocks when I was pregnant. I believe it’s a scientific fact that Pop Rocks are the single funniest food and even though I’m almost one-hundred years old, I still LOVE THEM. 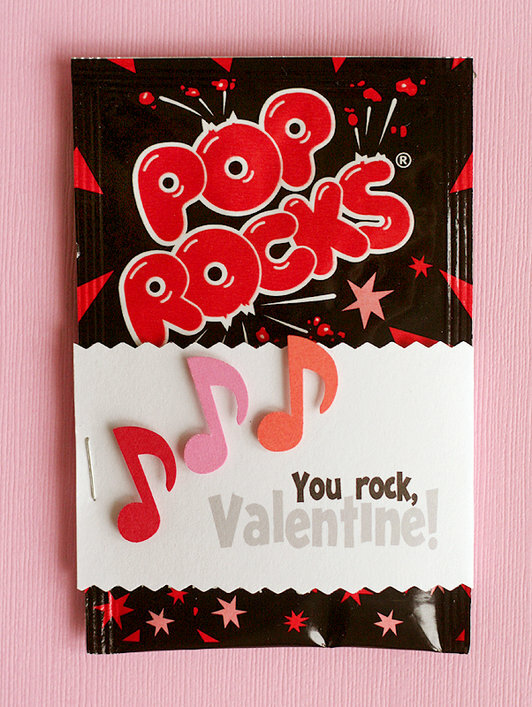 Fiskars came up with a super simple, but very fun idea for your Pop Rocks loving Valentine. 5. I am smitten with this little book from PaperVine. 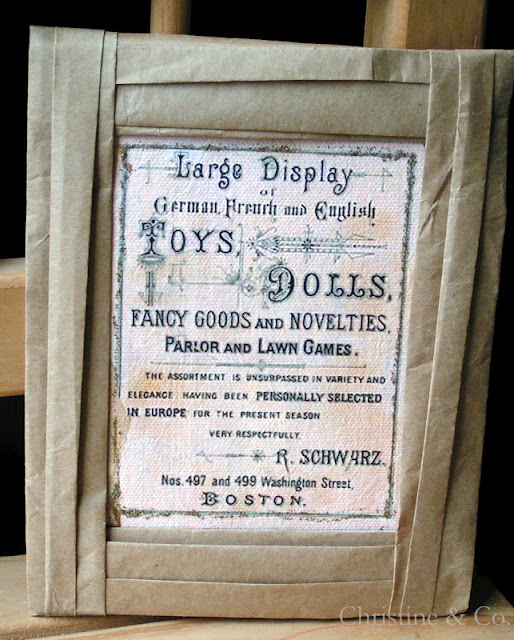 It’s made from a deck of playing cards! Can you even stand it? 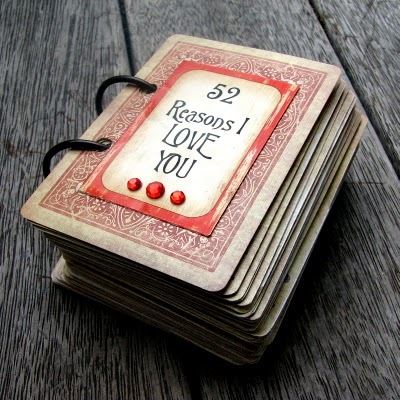 Of course you’ll have to come up with 52 reasons you love somebody – which might not be a bad thing to do! 6. Martha Stewart is the Queen of DIY. Yes – she makes me feel like a big loser because I don’t know how to make a new sofa out of old credit cards, cereal boxes, and Gatorade lids. 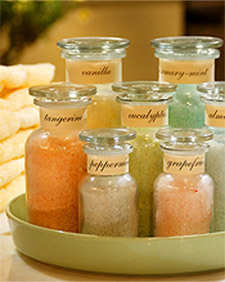 But these delightful homemade bath salts are so easy, I think even I could make them. 7. 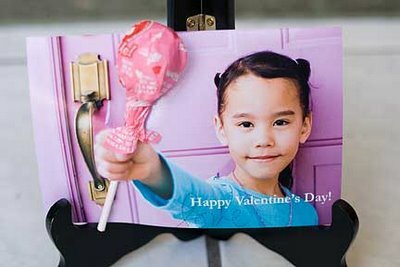 From 24-7-365 comes these cutie-patootie Valentine’s cards made from photos of your kiddos with outstretched hands. Why am I not smart enough to come up with something like this? I think I need more Vitamin B in my diet or something.